This small island, also called Salamis, is nearest to Athens and can be reached by boat from Piraeus, from Perama to the west of Piraeus, and from Megara on the main road to Corinth. In spite of its small size of 95 square kilometers, it has a population of nearly 30,000, as it is a very short commute to the mainland. Once covered in pine trees, much of the land has been cleared for housing purposes, and this island could really be considered a suburb of Athens. Very well known in mythology and from the pages of Greek history books, it is here where the mythical Ajax was born, who led his people in the war against Troy. 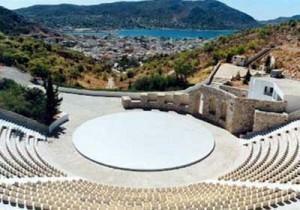 It is also the birthplace of the great poet and playwright, Euripides. Of course, its most famous claim to fame is the legendary sea-battle between the Persians and the Athenians in 480 BC, which set the stage for the flourishing of the great Golden Age. Today, Salamina is a weekend destination for many Athenians who have weekend homes here. There are some good beaches on the island, especially in the south, and plenty of restaurants and tavernas throughout the island but no hotels, so prospective visitors must take into consideration that one can only visit the otherwise very interesting island on a one-day excursion basis. Some interesting sights to see include the 11th Century church at the convent of Faneromeni at the northwest tip of the island that looks across the strait to Megara. On the west coast and six kilometers south of the capital, Salamina or Koulouri, is the site of the ancient city of Ajax. Further south, you will find many excellent sandy beaches. On the east coast is the main port for ferries from Perama and Piraeus, called Paloukia. Moving south from there is another busy little port that is also used, called Kamatero. Very near is the site of ancient Salamis, with some ruins of its acropolis. These are located in the village of Ambelakia. If you continue three kilometers further south, you come to the large fishing village of Selinia. During the summer season, there are smaller vessels crossing from here to Piraeus. With such easy access from the mainland, it is an excellent island to explore for a day or two, and there are plenty of shops, fish tavernas, and lively nightlife to keep you busy.